Shown above is an image of a piece of art created by a veteran at the Gino J. Merli Veterans’ Center in Scranton, PA. In 2017-18 the Pennsylvania Council on the Arts (PCA) and the Pennsylvania Department of Military and Veterans Affairs (DMVA) joined together to bring collaborative, creative programming to veterans with dementia at all six Veterans Homes in Pennsylvania. This was accomplished through staff and artist participation in an evidence-based, award-winning training program called TimeSlips. TimeSlips is a creative storytelling method that opens storytelling to everyone by replacing the pressure to remember with encouragement to imagine. It was originally designed as a way for people with dementia and their care partners to share in creative expression together. 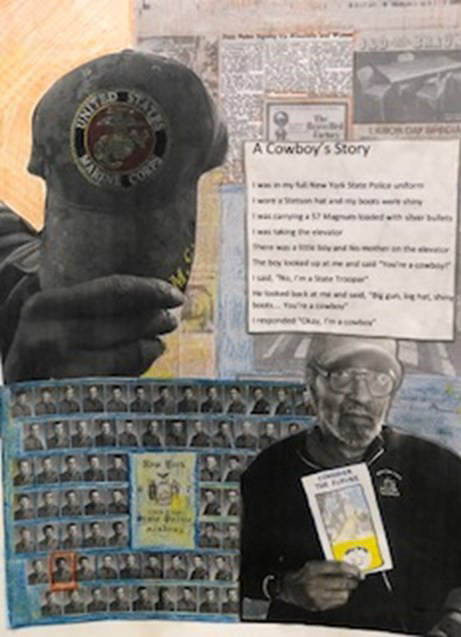 The PCA Arts in Education Partners connected each veterans’ home with a teaching artist from that community. The teaching artist along with activities staff at the home, received certification training in TimeSlips which enables them to use person-centered, creative engagement techniques in their work with the veterans. The teaching artist at each home led a 20-day Arts in Education residency where they used TimeSlips techniques to guide the veterans through creative artmaking experiences. Each 20-day residency ended with a celebration event that highlighted the work created through the program. The outcomes from this pilot partnership were truly inspiring. The experience for the veterans, staff, care givers and artists went beyond the creative process. A sense of comfort and community developed through the sessions. The veterans took great pride in their art work and stories. The staff learned new ways to connect and engage with the residents and with each other. Being creative in a safe space provided an opportunity to bond and to share. All six homes will continue this work in 2018-19 with support from the Pennsylvania Council on the Arts and Pennsylvania Department of Military and Veterans Affair. Each home will have the opportunity to develop artist residencies that build off of their first year experience. Staff at each home will continue to use the TimeSlips techniques to build relationships with the veterans and with each other. Both agencies are incredibly proud of this first collaborative venture and plan to grow the partnership for our Pennsylvania Veterans and their care givers.